A campaign to reduce the number of stillbirths in the UK each year has been launched by charity Count The Kicks and both Holly Willoughby and Alesha Dixon have added their support to help raise awareness. 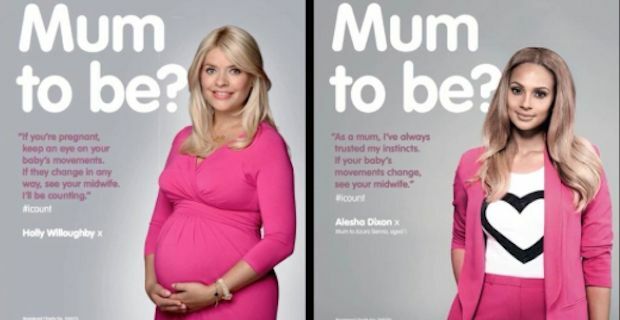 Both girls are mothers who have recently given birth so they are in the perfect position to connect with British mums-to-be. The statistics surrounding stillbirths in the UK are staggering and 17 babies are stillborn each and every day. Count The Kicks was launched in 2009 after founder the stillbirth of founder Sophia Mason's daughter Chloe. The charity focuses on educating mothers on being aware of their babies movements and seeking medical help should they notice any unusual changes during pregnancy. Willoughby revealed that a high number of stillborn babies could be saved saying "Having recently given birth myself, this campaign really resonates with me. The sad fact is that a third of stillborn babies are perfectly formed and born at gestation, when they could safely be delivered. That is a frightening statistic and that is why I fully support the work that Count the Kicks are doing in educating mums-to-be about being aware of their baby's movements." Dixon also shared some facts about stillbirths saying "I'm a mum myself so can really empathise with what women who go through the tragedy of stillbirth must feel. Only around 10 per cent of stillbirths are caused by a fatal congenital abnormality meaning there is a potential to save up to 90% of stillborn babies." Willoughby recently gave birth to her third child, named Chester William, while Dixon is mother to her 1 year old child Azura Sienna. You can find more information about baby movements during pregnancy and how to count a baby's kicks at www.countthekicks.org.uk.